*Save $20 on your second unit! Electrodry's Air Conditioner cleaning removes mould, dirt and contaminant from your air conditioner making it work more efficiently. Your air conditioner will function effectively which dramatically increasing cooling and air flow. *Savings figure based on commercial cooling system. 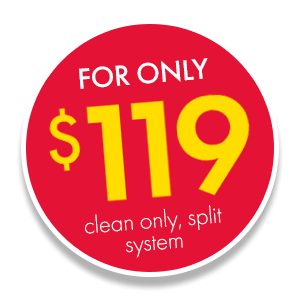 HAVE YOUR AIR CONDITIONER CLEANED STARTING AT $119! * BOOK ONLINE NOW! There are so many health benefits you’ll enjoy from having a clean conditioner, with the family breathing in less contaminants every time you turn on the system. Your fully trained technician will happily explain the process to you and answer any questions you may have – ask away! HOW DOES ELECTRODRY CLEAN MY AIR CONDITIONER? We know there’s other air conditioning cleaning companies out there offering basic air conditioner cleans for low prices. You’re definitely getting what you’re paying for. Unfortunately a simple wipe down isn’t going to get the job done. Electrodry Brisbane uses innovative cleaning solutions and high powered equipment to target contaminants deep within your machine and give you the high quality results you’re after for a reasonable price! The team offers unparalleled customer service, and has built a solid reputation for the past three decades for doing the job right. We have thoroughly researched the steps below, to ensure that your system is running at its best. At the start of the job, the technician will turn off the power, cover electricals and protect your system by placing a place a bib around its base. We know you want the job completed effectively but that you also want safe solutions used. Our products are safe but also highly effective. The fins of the evaporative unit will get a blast with our high pressure cleaner, to make sure we’re hitting those contaminants where it hurts. Using the same high pressure cleaner, the technician will clean the barrel fan thoroughly. We want to make sure the job has been completed properly so we’ll conduct an air flow test to measure for cooler air flow compared to initial testing. Electrodry gives all our clients a 14-day satisfaction guarantee. If you are not totally satisfied, we will re-clean your items free of charge. WHY IS IT IMPORTANT TO CLEAN AN AIR CONDITIONER? Have you noticed a decline in your air conditioner’s performance, sometimes even having to check that it is actually on or that someone hasn’t toyed with the remote? It can be frustrating to be paying the energy bill but still feel like you’re sweating it out in summer. An Electrodry Air Conditioner clean means you can rest assured that your machine will be firing on all cylinders this summer, keeping you and the family completely comfortable. We all know how much of workout the air conditioner gets and it can sometimes feel like you’re throwing money away every time you hit the ‘on’ button. Get more bang for your buck by giving the Electrodry team a call – a professional clean undertaken by one of our technicians could reduce your energy consumption by up to 22%. Just think of all the other things you could spend your hard-earned dollars on! Fresh is best when it comes to the air your conditioner is blowing throughout your home. That’s why the Electrodry process includes a thorough pressure clean, to make sure that the mould, dirt and grime doesn’t continue to affect your family. A professional air conditioner clean is particularly important if you have someone in your family who suffers with allergies or respiratory issues such as asthma. HOW MUCH DOES AIR CONDITIONING CLEANING COST? An effective carpet dry cleaning system that's been an industry standard for over 30 years. Refresh grungy grout and tile work with Electrodry's unique Tile and Grout cleaning. Bring back the healthy sheen of timber floors with Electrodry's patented Timber Refresh system. Minimise scratches and revitalize worn out wood flooring without the fuss and mess of sanding with our Timber Restore. We thoroughly clean upholstered furniture using special cleaning solutions that are safe on even the most delicate of fabrics. Our healthy mattress cleaning is the ideal solution to remove dust mites, dead skin, and sweat stains for fresh and peaceful sleep. Slash off 20% from your energy consumption while reducing airborne allergens and keep your home cooler. We only employ Goldmorr approved Mould Remediation Technicians to effectively eliminate moulds and its spores. Electrodry Brisbane Carpet Cleaning are a confident bunch. They’ve had plenty of years of experience in the cleaning industry (more than 30, to be precise) and their products are backed by years of research. The team is so confident that they can offer you the exceptional results you want, there’s a 14-day guarantee on the service they provide. If your machine isn’t doing its job after our service, we’ll come back and re-clean free of charge, as long as you call us within 14 days. We all know how stifling Brisbane’s summers can be. Why wouldn’t you want your air conditioner operating at its finest? Operating in the city and across all Brisbane suburbs (from Albion to Wynnum and everywhere else), let Electrodry Brisbane’s expertise help you to stay cool this summer.